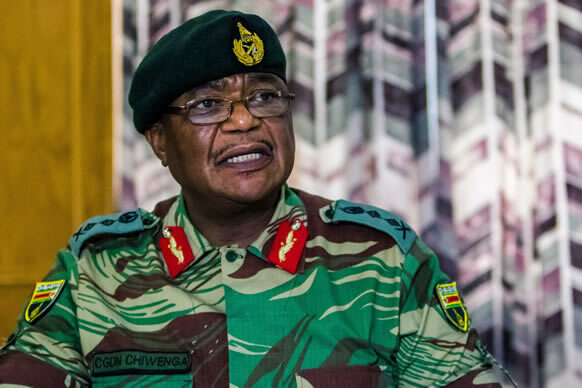 Army General Constantino Chiwenga Commander of the Zimbabwe Defence Forces addressing a media conference held at the Zimbabwean Army Headquarters in Harare. Zimbabwe ’s military has read out a statement after taking over the national broadcaster, ZBC , saying it has taken action to “ target criminals ”, BBC reports. However , it said this was not “a military takeover of government” and President Robert Mugabe was safe . Heavy gunfire and artillery were heard in northern suburbs of the capital, Harare , early on Wednesday. Zimbabwe ’s envoy to South Africa, Isaac Moyo, earlier dismissed talk of a coup , saying the government was “intact ” . The statement did not name those targeted but a government source quoted by Reuters said Finance Minister Ignatius Chombo was among those detained . It is not clear who is leading the military action .